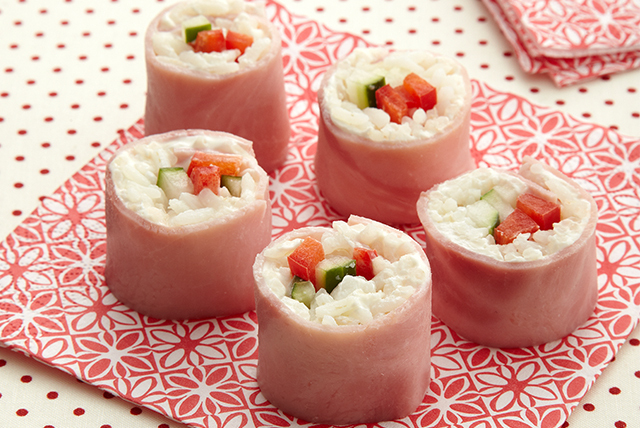 Basic ingredients are used to make these kid-friendly sushi snacks. Spread ham with cream cheese; top with rice, spreading to within 1/4 inch of edges. Place vegetables at one short end of each ham slice; roll up tightly. Cut each into 5 slices. Substitute thinly sliced carrots or avocados, or CLAUSSEN Kosher Dill Pickle Spears for the peppers and/or cucumbers. This is a great way to use leftover vegetables. Just cut them up and use instead of the peppers and/or cucumbers. Prepare using 1/4 cup PHILADELPHIA Cream Cheese Spread.